When we were moving to our new house last year, it dawned on me the importance of a Pickup vehicle. It took us numerous trips to finally transport all our stuff. And just when I thought the need for a pickup is over, it is just the beginning. New plants to purchase for the garden, additional furnishings for the rooms, and so on. Our reliable old car is not as functional as we thought it was. Planning on purchasing a new vehicle? Or probably want an additional car? Join Foton’s Big Show 2013′s Grand Launch at the World Trade Center on October 25 and witness the launching of the new FOTON View, the 1st dancing wheel loader in the Philippines. Get a chance to trade-in your old vehicles from October 26 to 27 avail of BIG DISCOUNTS and BIG REWARDS when purchasing FOTON vehicles at the event. Receive amazing giveaways just for coming and you get even more when you test drive our passenger vehicles or attend our forums and trainings. No entrance fee! 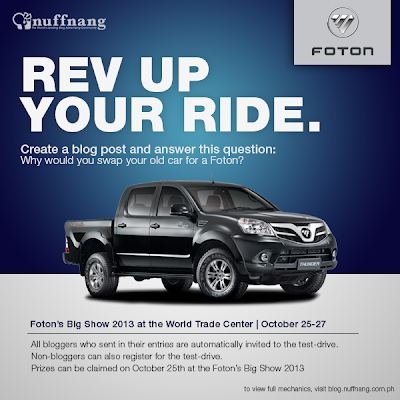 Sign up and attend the FREE test drive at the Foton's Big Show. Register here.